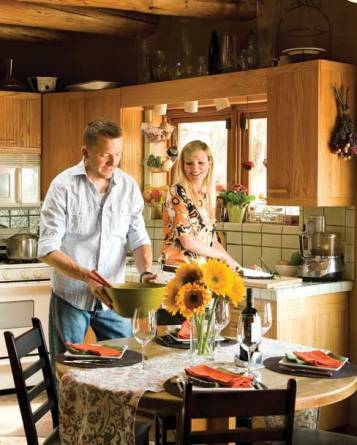 To most people, New Mexican food may seem meat-driven and lard-laden. Not true! The traditional foods of this region are based on a trinity of vegetables: corn, beans, and squash, which are poetically referred to as “The Three Sisters.” To this trifecta, I will add tomatoes and chile. We adhere mainly to a vegetarian diet in our household. (I’m a consummate omnivore, but Jody, the woman I love, is vegetarian. I see no sense in cooking two dinners every night!) I’m also a conscientious consumer and a proud locavore, the kind who likes knowing the first names of the people who grow, raise, and prepare the food we eat. Our last visit to the Santa Fe Farmers Market—which at this time of year is brimming with The Three Sisters—included sipping fresh-brewed coffee and sampling artisanal bread with local cheese. After a stroll through the market, and a few social calls, we departed with the majority of our groceries for the week, an armful of fresh flowers, and (OK, fine) some bison sausage. These tacos are made with fresh, not fried, corn tortillas. You can try your hand at making these ancient flatbreads or locate a tortilleria in your community—but there’s no substitute for fresh! Combine all ingredients in a large bowl and mix well, until a soft dough is achieved. If the dough is too sticky, add a little more masa harina. If it’s too dry, add a little more water. Divide dough into approximately 24 balls, cover, and set aside. Preheat a large, heavy skillet over a high heat and lightly oil. Cook in the skillet for about 1 minute on each side. Set aside cooked tortillas in a cloth-lined basket to keep them warm and moist. Although you may use pinto or black beans, this is a great recipe with which to try one of the heirloom varietals cultivated in New Mexico: rattlesnake, Anasazi, Jake’s Ranch, Appaloosa, and more. To decrease the gaseous quality for which beans are famous, soak the beans before cooking them. Sauté onion, carrot, and celery for 2 minutes. Add remaining ingredients, remove from heat and mix well. Season to taste. 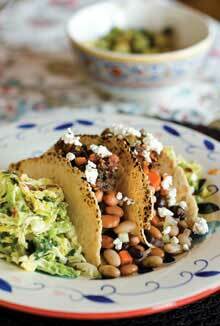 Place mixture in fresh tortillas and top with Blackened Tomato Salsa and Chipotle Cole Slaw. Preheat outdoor grill or broiler. Lightly coat tomatoes, onion slices, jalapeños, and garlic cloves with oil. Place directly on the grill or on a sheet pan under the broiler. Cook ingredients until tomato skins blacken. Grill or broil the orange halves until the edges are browned. Place the vegetables (not the orange) into a food processor along with cilantro. Pulse until desired consistency is achieved. Squeeze juice from the orange halves into salsa. Season with salt and pepper. In a large mixing bowl, combine mustard, chipotle en adobo, lime juice, and honey. Slowly whisk in olive oil until combined. Pour over cabbage and scallions. Mix well. Refrigerate for 30 minutes before seasoning and serving. Chile relleno is Spanish for “stuffed chile.” Although it is traditionally served stuffed with cheese and batter-fried, to be a relleno, it needn’t be served this way. Here’s a fresh, healthier take on the recipe. 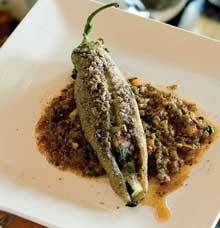 On an outdoor grill over high heat, roast chiles until the skin blisters and blackens all over. Place them in a small paper bag until they are cool enough to handle. Wipe away the blackened skin with a paper towel or a clean dishtowel. Do not rinse under the tap or soak in water—that method will wash away the flavor. Without removing the stem, slit the chiles from stem to tip and remove the seeds. The stem should remain intact. Preheat a non-stick pan over medium-high heat and sauté the zucchini, squash, and onion for 3 to 4 minutes stirring infrequently. Add garlic and corn, and sauté for another 2 minutes. Place sautéed mixture in a large mixing bowl to cool. Add remaining ingredients and season with salt and pepper. Spoon filling into prepared chiles and arrange on a lightly oiled cookie sheet with the opening facing up. Sprinkle each relleno with the blue corn mixture. Bake in a preheated 350- degree oven for 20 minutes or until hot and bubbly. 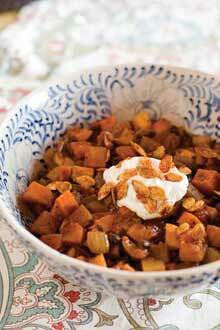 Although calabaza is often translated as “pumpkin,” it really means “winter squash.” Any of the winter varieties can be used in this stew. Combine squash, potato, onion, carrots, beets, garlic, olive oil, and salt in a large bowl and mix well. Place on a foil-lined sheet pan. Bake in a preheated 375-degree oven for 30 minutes or until squash is fork-tender. Place roasted veggies in a large soup pot and add remaining ingredients. Simmer for at least 30 minutes. Season to taste and serve with sour cream.